Children put many things in their mouths (including food) that can cause trouble. When you know that a child has ingested a foreign object, consider this a medical emergency and seek immediate attention. If your child is choking â€“ cannot breathe, is gasping, cannot talk, or is turning blue â€“ call 911 or an ambulance immediately. Aside from choking, trouble may happen if the object becomes lodged in the “airway” tube (trachea) instead of the “eating” tube (esophagus), which may make the child’s distress harder to see. Children may experience symptoms differently; some children can even have vague symptoms that do not immediately suggest ingestion. While most swallowed foreign objects pass harmlessly through the esophagus, the stomach, and intestines, a foreign body may also cause harm if it has associated toxicity or becomes lodged in the gastrointestinal tract. Parents should suspect their child might have swallowed a foreign object if breathing or swallowing difficulties persist longer than two weeks despite medical treatment. For example, continuing asthma or upper respiratory treatment without seeing improvement. Toxicityis another consequence of ingestion that may cause problems. Coins (for instance newer copper-coated zinc pennies) and batteries may cause system-wide reactions because some metals are extremely toxic and may cause inflammation. Treatment of the problem varies with the degree of airway blockage. If the object is completely blocking the airway, the child will be unable to breath or talk and his/her lips will become blue. This is a medical emergency and you should seek emergency medical care. Sometimes, surgery is necessary to remove the object. Children that are still talking and breathing but show other symptoms also need to be evaluated by a physician immediately. Call 911 or an ambulance. Lay the child on the floor on his/her back. Repeat this life saving procedure until the ambulance arrives. Make sure you tell the medical team immediately what caused the child to choke or what obstructs the breathing so that proper treatment can be administered. It is a well-known fact among parents that children sometimes put things such as dried beans, small toys, or beads in their ears, nose, or mouth. Such inappropriate objects may cause harm if immediate medical attention is not provided. Often, caregivers are unaware that a child has taken in such an object and this makes getting the right treatment more difficult. The symptoms caused by these objects range from discomfort and pain, to decreased hearing, changes or noises from breathing, difficulty swallowing or choking and sometimes drainage especially from objects in the ear or nose. If there is difficulty breathing, the object could cause serious problems and immediate action should be taken. Doctors call these objects foreign bodies. A recent medical studyhas shown that with some people it is hard to see certain types of foreign bodies with the naked eye. It recommends that “these cases should be referred directly to otolaryngologists for otomicroscopic removal or removal with special light scopes.” In other words, an ear, nose, and throat specialist physician should remove such objects to avoid further harm. Children under age five are the most likely to ingest foreign bodies in the ear, nose, or airway. But teenagers and irresponsible adults have been known to engage in such activities as well, though these are often accidental happenings. 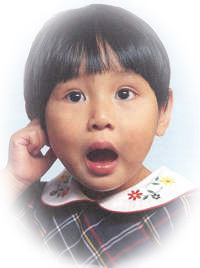 Foreign bodies in the ear canal are found most often in children between the ages of two and four. Airway obstruction from foreign bodies may cause suffocation and death. This accounts for nearly nine percent of accidental deaths in the home, especially among children under the age of five years. About five percent of all children swallow coins, and a coin-swallower’s average age is three. Children usually place things in their ear canal because they are bored, curious, or copying other children. Sometimes one child may put an object in another child’s ear during play. It is important for parents to be aware that children may cause themselves or other children great harm by placing objects in the ear. There may also be a link between chronic outer ear infections and children who tend to place things in their ears. Insects may also fly into the ear canal, causing potential harm. Any child with a chronically draining ear should be evaluated for a foreign body. Some of the items that are commonly found in the ear (usually the canal) of young children include the following: food, insects, toys, buttons, pieces of crayon, and small button-shaped batteries. Teenagers sometimes have objects imbedded in the ear lobe due to an infection from a pierced ear or a poorly healed piecing. use of a suction machine to help pull the object out. After removal of the object, your child’s physician will re-examine the ear to determine if there has been any injury to the ear canal. Antibiotic drops for the ear may be prescribed to treat any possible infections. Objects that are put into the child’s nose are usually, but not always, soft things like tissue, clay, and pieces of toys or erasers. Harder objects, much like those commonly put in the ear, may also be put into the nose. From time to time, a foreign body may enter the nose while the child is trying to smell the object. The most common symptom of a foreign body in the nose is nasal drainage. The drainage often has a bad odor. Parents should suspect a foreign body and not a “cold” when drainage is from only one nostril. In some cases, the child may alsohave a bloody nose. Foreign objects in your child’s nose should be removed promptly. Sedating the child is sometimes necessary in order to remove the object successfully. This may necessitate a trip to the hospital, depending on the extent of the problem and the cooperation of the child. Some of the techniques that your child’s physician may use to remove the object from the nose include suction machines with tubes attached or instruments such as small tweezers called forceps. After removal of the object, your child’s physician may re-examine the nose with a special fiberoptic light looking for another foreign body or may prescribe nose drops or antibiotic ointments to treat any possible infections. Obesity can present significant health risks to the young child. Diseases are being seen in obese children that were once thought to be adult diseases. Many experts in the study of children’s health suggest that a dysfunctional metabolism, or failure of the body to change food calories to energy, precedes the onset of disease. Consequently, these children are at risk for Type II Diabetes, fatty liver, elevated cholesterol, SCFE (a major hip disorder), menstrual irregularities, sleep apnea, and irregular metabolism. Additionally, there are psychological consequences; obese children are subject to depression, loss of self-esteem, and isolation from their peers. Sleep apnea: Children with sleep apnea literally stop breathing repeatedly during their sleep, often for a minute or longer, usually ten to 60 times during a single night. Sleep apnea can be caused by either complete obstruction of the airway (obstructive apnea) or partial obstruction (obstructive hypopneaâ€”hypopnea is slow, shallow breathing), both of which can wake one up. There are three types of sleep apneaâ€”obstructive, central, and mixed. Of these, obstructive sleep apnea (OSA) is the most common. Otolaryngologists have pioneered the treatment for sleep apnea; research shows that one to three percent of children have this disorder, often between the age of two-to-five years old.Enlarged tonsils, which block the airway, are usually the key factor leading to this condition. Extra weight in obese children and adults can also interfere with the ability of the chest and abdomen to fully expand during breathing, hindering the intake of air and increasing the risk of sleep apnea.The American Academy of Pediatrics has identified obstructive sleep apnea syndrome (OSAS) as a “common condition in childhood that results in severe complications if left untreated.” Among the potential consequences of untreated pediatric sleep apnea are growth failure; learning, attention, and behavior problems; and cardio-vascular complications. Because sleep apnea is rarely diagnosed, pediatricians now recommend that all children be regularly screened for snoring. Middle ear infections: Acute otitis media (AOM) and chronic ear infections account for 15 to 30 million visits to the doctor each year in the U.S. In fact, ear infections are the most common reason why an American child sees a doctor. Furthermore, the incidence of AOM has been rising over the past decades. Although there is no proven medical link between middle ear infections and pediatric obesity there may be a behavioral association between the two conditions. Some studies have found that when a child is rubbing or massaging the infected ear the parent often responds by offering the child food or snacks for comfort.When a child does have an ear infection the first line of treatment is often a regimen of antibiotics. When antibiotics are not effective, the ear, nose and throat specialist might recommend a bilateral myringotomy with pressure equalizing tube placement (BMT), a minor surgical procedure. This surgery involves the placement of small tubes in the eardrum of both ears. The benefit is to drain the fluid buildup behind the eardrum and to keep the pressure in the ear the same as it is in the exterior of the ear. This will reduce the chances of any new infections and may correct any hearing loss caused by the fluid buildup.Postoperative vomiting (POV) is a common problem after bilateral myringotomy surgery. The overall incidence is 35 percent, and usually occurs on the first postoperative day, but can occur up to seven days later. Several factors are known to affect the incidence of POV, including age, type of surgery, postoperative care, medications, co-existing diseases, past history of POV, and anesthetic management. Obesity, gastroparesis, female gender, motion sickness, pre-op anxiety, opiod analgesics, and the duration of anesthetic all increase the incidence of POV. POV interferes with oral medication and intake, delays return to normal activity, and increases length of hospital stay. It remains one of the most common causes of unplanned postoperative hospital admissions. Tonsillectomies: A child’s tonsils are removed because they are either chronically infected or, as in most cases, enlarged, leading to obstructive sleep apnea. There are several surgical procedures utilized by ear, nose, and throat specialists to remove the tonsils, ranging from use of a scalpel to a wand that emits energy that shrinks the tonsils.Research conducted by otolaryngologists found that morbid obesity was a contributing factor for requiring an overnight hospital admission for a child undergoing removal of enlarged tonsils. Most children who were diagnosed as obese with sleep apnea required a next-day physician follow-up.A study from the University of Texas found that morbidly obese patients have a significant increase of additional medical disorders following tonsillectomy and adenoidectomy for obstructive sleep apnea or sleep-disordered breathing when compared to moderately obese or overweight patients undergoing this procedure for the same diagnosis. On average they have longer hospital stays, a greater need for intensive care, and a higher incidence of the need for apnea treatment of continuous positive airway pressure upon discharge from the hospital. The study found that although the morbidly obese group had a greater degree of sleep apnea, they did benefit from the procedure in regards to snoring, apneic spells, and daytime somnolence. Adenoidectomy â€“ removal of the adenoids, also called pharyngeal tonsils. Some believe their removal helps prevent ear infections. Analgesia â€“ immediate pain relief. For an earache, it may be provided by acetaminophen, ibuprofen, and auralgan. Antibiotic resistance â€“ a condition where micro-organisms continue to multiply although exposed to antibiotic agents, often because the bacteria has become immune to the medication. Overuse or inappropriate use of antibiotics leads to antibiotic resistance. Audiometer – an electronic device used in measuring hearing for pure tones of frequencies, generally varying from 125â€“8000 Hz, and speech (recorded in terms of decibels). Azithromyacin â€“ an antibiotic prescribed for acute otitis media due to Haemophilus influenzae, Streptococcus pneumoniae, and Moraxella catarrhalis. Also known by its brand name, Zithromax. Bacteria â€“ organisms responsible for about 70 percent of otitis media cases. The most common bacterial offenders are Streptococcus pneumoniae, Haemophilus influenzae and Moraxella catarrhalis. Chronic otitis media â€“ when infection of the middle ear persists, leading to possible ongoing damage to the middle ear and eardrum. Decibel â€“ one tenth of a bel, the unit of measure expressing the relative intensity of a sound. The results of a hearing test are often expressed in decibels. Effusion â€“ a collection of fluid generally containing a bacterial culture. First-line agent â€“ The first treatment of antibiotics prescribed for an ear infection, often amoxicillin. Myringotomy â€“ an incision made into the ear drum. OtoLAMÐ´ â€“ a myringotomy performed with computer-driven laser technology (rather than manual incision with a conventional scalpel). Recurrent otitis media â€“ when the patient incurs three infections in three months, four in six months, or six in 12 months. This is often an indicator that a tympanostomy with tubes might be recommended. Second line treatment â€“ antibiotics prescribed when the first line of treatment fails to resolve symptoms after 48 hours. Trimethoprim Sulfamethoxazole â€“ an alternative first line treatment for children allergic to amoxicillin. Tympanostomy tubes â€“ small tubes inserted in the eardrum to allow drainage of infection. Your child has been diagnosed with allergic rhinitis, a physiological response to specific allergens such as pet dander or ragweed. The symptoms are fairly simple — a runny nose (rhinitis), watery eyes, and some periodic sneezing. The best solution is to administer over-the-counter antihistamine, and the problem will resolve on its own …right? Not really â€“ the interrelated structures of the ears, nose, and throat can cause certain medical problems which trigger additional disorders â€“ all with the possibility of serious consequences. Ear infections: One of children’s most common medical problems is otitis media, or middle ear infection. These infections are especially common in early childhood. They are even more common when children suffer from allergic rhinitis (hay fever) as well. Allergic inflammation can cause swelling in the nose and around the opening of the Eustachian tube (ear canal). This swelling has the potential to interfere with drainage of the middle ear. When bacteria laden discharge clogs the tube, infection is more likely. Sore throats: The hay fever allergens may lead to the formation of too much mucus which can make the nose run or drip down the back of the throat, leading to “post-nasal drip.” It can lead to cough, sore throats, and husky voice. Although more common in older people and in dry inland climates, thick, dry mucus can also irritate the throat and be hard to clear. Air conditioning, winter heating, and dehydration can aggravate the condition. Paradoxically, antihistamines will do so as well. Some newer antihistamines do not produce dryness. Snoring: Chronic nasal obstruction is a frequent symptom of seasonal allergic rhinitis (hay fever) and perennial (year-round) allergic rhinitis. This allergic condition may have a debilitating effect on the nasal turbinates, the small, shelf-like, bony structures covered by mucous membranes (mucosa). The turbinates protrude into the nasal airway and help to warm, humidify, and cleanse air before it reaches the lungs. When exposed to allergens, the mucosa can become inflamed. The blood vessels inside the membrane swell and expand, causing the turbinates to become enlarged and obstruct the flow of air through the nose. This inflammation, or rhinitis, can cause chronic nasal obstruction that affects individuals during the day and night.Enlarged turbinates and nasal congestion can also contribute to headaches and sleep disorders such as snoring and obstructive sleep apnea, because the nasal airway is the normal breathing route during sleep. Once turbinate enlargement becomes chronic, it is irreversible except with surgical intervention. Pediatric sinusitis: Allergic rhinitis can cause enough inflammation to obstruct the openings to the sinuses. Consequently, a bacterial sinus infection occurs. The disease is similar for children and adults. Children may or may not complain of pain. However, in acute sinusitis, they will often have pain and typically have fever and a purulent nasal discharge. In chronic sinusitis, pain and fever are not evident. Some children may have mood or behavior changes. Most will have a purulent, runny nose and nasal congestion even to the point where they must mouth breathe. The infected sinus drains around the Eustachian tube, and therefore many of the children will also have a middle ear infection.Seasonal allergic rhinitis may resolve after a short period. Administration of the proper over-the-counter antihistamines may alleviate the symptoms. However, if your child suffers from perennial (year round) allergic rhinitis, an examination by specialist will assist in preventing other ear, nose, and throat problems from occurring. The 2000 census reported that of among the nation’s 19.6 million preschoolers, grandparents took care of 21 percent, 17 percent were cared for by their father (while their mother was employed or in school); 12 percent were in day care centers; nine percent were cared for by other relatives; seven percent were cared for by a family day care provider in their home; and six percent received care in nursery schools or preschools. More than one-third of preschoolers (7.2 million) had no regular child-care arrangement and presumably were under maternal care. What are your child’s risks of being exposed to a contagious illness at a day care center? When your child is in a day care center, the risk is greatest for viral upper respiratory infection (affecting the nose, throat, mouth, voice box) and the common cold, ear infections, and diarrhea. Some studies have tried to link asthma to day care. Other studies suggest that being exposed to all the germs in day care actually IMPROVES your child’s immune system. Studies suggest that the average child will get eight to ten colds per year, lasting ten – 14 days each, and occurring occurring primarily in the winter months. This means that if a child gets two colds from March to September, and eight colds from September to March, each lasting two weeks, the child will be sick more than over half of the winter. Tonsils are the two pink lumps of tissue found on each side of the back of your throat. (Open your mouth wide and say ‘ahhhh’ in front of a mirror to see them.) Each grape-size lump fights off the bad bacteria or germs living in your body. Bacteria (bad germs) are tiny living things that can cause sickness and infection. Too many bad germs on your tonsils can make you sick. This is what your doctor calls tonsillitis (ton-sil-lie-tis), or an infection in one or both of your tonsils. Will I have to visit the doctor? Once your doctor examines the results, he or she will decide if you have tonsillitis. What happens after the doctor says I have tonsillitis? If your doctor decides you have tonsillitis, he will probably give you an antibiotic, a medicine that gets rid of bad bacteria. If you have tonsillitis a lot, your doctor will contact an otolaryngologist (oh-toe-lair-in-goll-oh-gist), a doctor who specializes in taking care of the ears, nose, and throat. This doctor might tell you to take some more antibiotics but if your throat continues to hurt, you might be told you need a tonsillectomy. A tonsillectomy (ton-seh-leck-teh-me) is an operation where your tonsils are taken out of your throat. If you have tonsillitis a lot, or if your tonsils get really big and you have trouble breathing, your doctor and parents may decide they need to be removed. What happens when I have a tonsillectomy? After dinner the night before your tonsillectomy, you won’t be allowed to eat or drink anything — even water! When you arrive at the hospital, you’ll put on a special bracelet with your name on it and hospital clothes. Then you will meet the doctors and nurses that will be helping you. When the doctor is ready, you’ll be given a special medicine that makes you fall asleep. Then, the doctor and nurses will use special tools to remove your tonsils. It doesn’t take very long â€“ just about 20 minutes! When you wake up, you will be with your Mom or Dad and the operation will be all over. Your throat will hurt but the nurses and doctors will keep an eye on you to make sure you’re okay. In a few hours you will be ready to go home. Your throat will be sore for a few weeks, but your tonsils won’t bother you ever again! When you get home, be sure to drink a lot and get lots of rest. It will help to keep your throat moist and your body energized. You can eat non-dairy popsicles and other cold treats or soft food that makes your throat feel better, but save ice cream for the next day. Ice cream and other milk products can make your throat worse right after the operation. Within two weeks, you’ll be back to school and better than ever! Snoring:A problem if a child shares a room with a sibling and during sleepovers. Attention deficit disorder (ADD) / attention deficit hyperactivity disorder (ADHD):There are research findings that identify sleep disordered breathing as a contributing factor to attention deficit disorders. 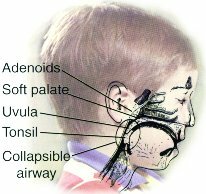 A child with suspected SDB should be evaluated by an otolaryngologist â€“ head and neck surgeon. If the symptoms are significant and the tonsils are enlarged, the child is strongly recommended for T&A, or tonsillectomy and adenoidectomy (removal of the tonsils and adenoids). Conversely, if the symptoms are mild, academic performance remains excellent, the tonsils are small, and puberty is eminent (tonsils and adenoids shrink at puberty), it may be recommended that SDB be treated only if matters worsen. The majority of cases fall somewhere in between, and physicians must evaluate each child on a case-by-case basis. You can reduce the risk of sinus infections for your child by reducing exposure to known allergens and pollutants such as tobacco smoke, reducing his/her time at day care, and treating stomach acid reflux disease. Chronic sinusitis: If your child suffers from one or more symptoms of sinusitis for at least 12 weeks, he or she may have chronic sinusitis. Chronic sinusitis or recurrent episodes of acute sinusitis numbering more than four to six per year are indications that you should seek consultation with an ear, nose, and throat (ENT) specialist. The ENT may recommend medical or surgical treatment of the sinuses. Only a small percentage of children with severe or persistent sinusitis require surgery to relieve symptoms that do not respond to medical therapy. Using an instrument called an endoscope, the ENT surgeon opens the natural drainage pathways of your child’s sinuses and makes the narrow passages wider. This also allows for culturing so that antibiotics can be directed specifically against your child’s sinus infection. Opening up the sinuses and allowing air to circulate usually results in a reduction in the number and severity of sinus infections. Your doctor may advise removing adenoid tissue from behind the nose as part of the treatment for sinusitis. Although the adenoid tissue does not directly block the sinuses, infection of the adenoid tissue, called adenoiditis, or obstruction of the back of the nose, can cause many of the symptoms that are similar to sinusitis, namely, runny nose, stuffy nose, post-nasal drip, bad breath, cough, and headache. Fever: A low-grade fever may be observed several days after surgery. Contact your physician if the fever is greater than 102Ñ”. Unfortunately, there may be a time when medical therapy (antibiotics) fails to resolve the chronic tonsillar infections that affect your child. In other cases, your child may have enlarged tonsils, causing loud snoring, upper airway obstruction, and other sleep disorders. The best recourse for both these conditions may be removal or reduction of the tonsils and adenoids. The American Academy of Otolaryngologyâ€”Head and Neck Surgery recommends that children who have three or more tonsillar infections a year undergo a tonsillectomy; the young patient with a sleep disorder should be a candidate for removal or reduction of the enlarged tonsils. Carbon dioxide laser: Laser tonsil ablation (LTA) finds the otolaryngologist employing a hand-held CO2 or KTP laser to vaporize and remove tonsil tissue. This technique reduces tonsil volume and eliminates recesses in the tonsils that collect chronic and recurrent infections. This procedure is recommended for chronic recurrent tonsillitis, chronic sore throats, severe halitosis, or airway obstruction caused by enlarged tonsils. Microdebrider: What is a “microdebrider?” The microdebrider is a powered rotary shaving device with continuous suction often used during sinus surgery. It is made up of a cannula or tube, connected to a hand piece, which in turn is connected to a motor with foot control and a suction device. The endoscopic microdebrider is used in performing a partial tonsillectomy, by partially shaving the tonsils. This procedure entails eliminating the obstructive portion of the tonsil while preserving the tonsillar capsule. A natural biologic dressing is left in place over the pharyngeal muscles, preventing injury, inflammation, and infection. The procedure results in less post-operative pain, a more rapid recovery, and perhaps fewer delayed complications. However, the partial tonsillectomy is suggested for enlarged tonsils â€“ not those that incur repeated infections. Bipolar Radiofrequency Ablation (Coblation): This procedure produces an ionized saline layer that disrupts molecular bonds without using heat. As the energy is transferred to the tissue, ionic dissociation occurs. This mechanism can be used to remove all or only part of the tonsil. It is done under general anesthesia in the operating room and can be used for enlarged tonsils and chronic or recurrent infections. This causes removal of tissue with a thermal effect of 45-85 CÂ°. The advantages of this technique are less pain, faster healing, and less post operative care. 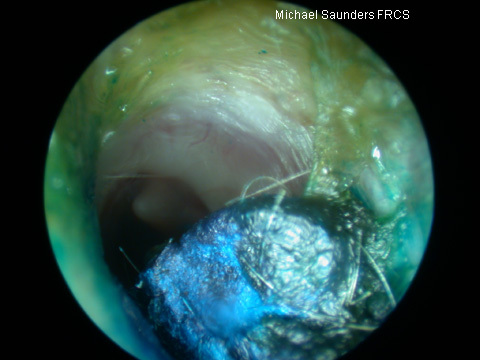 Is surgery effective against recurrent otitis media and otitis media with effusion? Before the procedure: Prior to the procedure, the otolaryngologist will examine the patient for a description of the tympanic membrane (eardrum) and the middle ear space. An audiometry may be performed to assess patient hearing. A tympanometry will be performed that tests compliance of the tympanic membrane at various levels of air pressure. This test provides a measurement of the extent of middle ear effusion, Eustachian tube function, and otitis media. After the procedure: Immediately after the procedure, the surgeon will examine the patient for persistent or profuse bleeding or discharge. After one month, the tube placement will be reviewed, and the patient’s hearing may be tested. Later, the physician will assess the tube’s effectiveness in alleviating the ear infection.